Foreign Ministers from Bahrain, Saudi Arabia say Iran threatens the rest of the Middle East, undermines Arab-Israeli peace efforts. Bahrain Foreign Minister Khalid bin Ahmed Al Khalifa strongly criticized the Islamic Republic of Iran during the international conference which took place in Warsaw this week. He said that the boundaries of the Arab-Israeli conflict were clear, even when Egypt and Jordan were officially at war with the Jewish State. "But we saw another challenge from 1979 that came to us from Tehran, and that has no boundaries. We would wake up every day with a new challenge from them." He further stated that Iranians are a peace-loving people, but their current leaders are not. "If it wasn't for the toxic money, guns, and foot soldiers of the Islamic Republic, I think we would have been much closer today to solving this issue with Israel," he said, adding that Iran threatened his country as well as many other nations in the Middle East. His sentiments were echoed by other Arab dignitaries at the same panel. 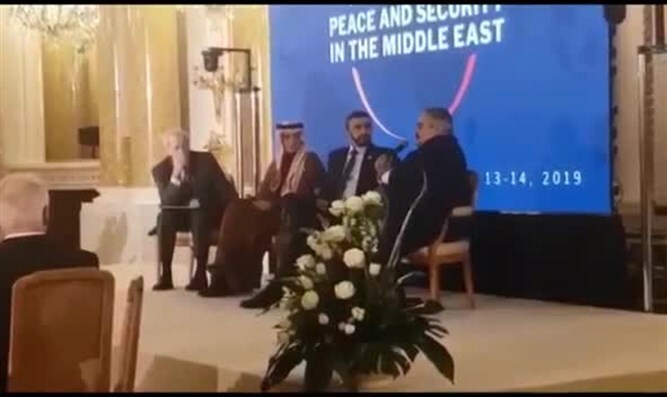 Saudi Foreign Minister Adel al-Jubeir stated: "Everywhere in the region of Iran plays a destructive role, look at the Palestinians - who supports Hamas and the Islamic Jihad that harm the Palestinian Authority, who is making a mess in Syria? Iran. Who is trying to smuggle chemical weapons to Kuwait and Bahrain? Iran. Who s building weapons factories in Sudan? Iran. Who is trying to do a mess in Africa, Indonesia, Thailand? Iran can be found everywhere." "It is impossible to stabilize the region without peace between Israel and the Palestinians, and it is impossible to stabilize the region without peace in Lebanon and Syria, and every time we go to this region, we see the evil behavior of Iran ... If we want peace and stability in the Middle East, we must make clear to the Iranians that if they want to be treated as a normal country They have to behave like a normal country," al-Jubeir added.